Rev. Eugene J. McCarthy, CSV, died July 13, 1967 at Hinsdale Sanitarium and Hospital in Hinsdale, IL, from complications of tuberculosis. He was 70. Fr. McCarthy was born and raised on Chicago’s West side by Irish-English immigrant parents. While attending St. Philip High School, Fr. McCarthy’s father died, forcing him to leave school. 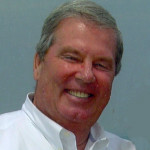 Throughout these years, however, he remained active in youth activities of his parish and was recognized as a leader. During World War I, he served in the U.S. Navy and was stationed at Great Lakes Training Camp near North Chicago, IL. After the war, he worked as an electrician. Still involved in parish activities, he became interested in becoming a priest and was encouraged at the age of 25, to resume his high school studies at St. Viator Academy in Bourbonnais, IL. After completing his high school requirements, he entered St. Viator College in the fall of 1923. He became known as “Old Mac,” out of respect for his courage and in recognition of his leadership on campus. Fr. McCarthy entered the Viatorian Novitiate located in Chamberlain, SD in 1926, and pronounced his first vows on August 15, 1926. He then resumed his college studies in Bourbonnais, graduating in 1928. In 1929, McCarthy attended Catholic University of America in Washington DC for his theological studies. He was ordained to the priesthood on June 10, 1933 and received his master’s in Social Work four days later. Fr. 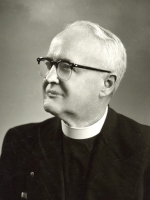 McCarthy served in pastoral ministry at St. Viator Parish in Chicago from 1933-1938 and again from 1952-1956, and at St. Joseph Church in Springfield from 1938-1940. He performed administrative duties in Cabery, IL from 1956-1961, before serving his last appointment from 1961-1966, at St. Joseph Church in Manteno. His teaching assignments were just as varied, including terms at Dowling College in Des Moines from 1940 to 1942, Sacred Heart Seminary in Melrose Park, IL from 1942-1944 and at Fr. McCarthy’s alma mater, St. PhilipHigh School in Chicago, from 1944-1952. Apparently living with confreres during his years at St. Philip, resulted in his best teaching. The funeral Mass for Fr. McCarthy took place at July 17 at St. Joseph Church in Manteno, where he had been an administrator. The Rev. Thomas Fitzpatrick, CSV, offered the homily. Burial took place in the Viatorian plot at Queen of Heaven Cemetery in Hillside, IL.